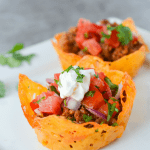 These Keto Cheese Shell Taco Cups are the easiest way to get your taco on…low carb style! Raise your hand if you love tacos. I can just tell how many hands are raised right now, and how many of you are so excited for this recipe. But I’m still really excited to show you the newest innovation in low carb taco-eating. Want my solution? Put the cheese on inside a muffin tin! Depending on the side of your muffin pan (I used Jumbo because…come on) you can make mini or huge cups. I just placed slices of colby cheese on parchment and baked at 375 for a few minutes. They will still be bubbly when you take them out. Let them cool a couple minutes until you can lift them, then place into a non stick muffin tin. 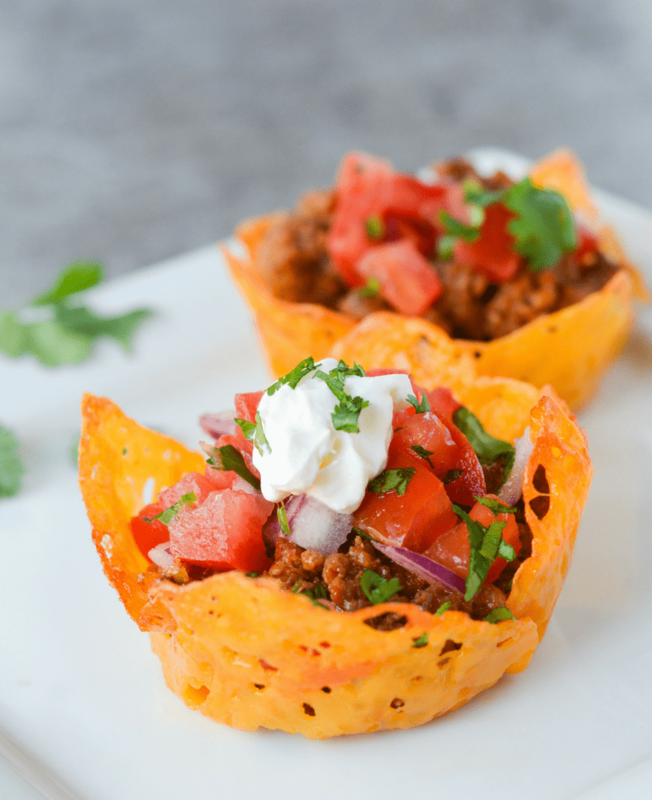 Let them continue to cool for about 10 minutes, then just fill them up with your favorite taco goodies, and…voila! You are THE BEST!!! 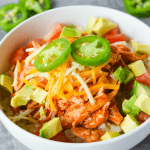 Love me a good keto recipe, but this is a GREAT keto recipe. The cheese cup is a true game changer! What a fantastic idea– cheese slices. I make wraps, pizza crusts, etc. ; however, I always use shredded cheese. This will be great to make the bowls–THANKS!!!! Do you use pre sliced cheese? Does it matter? I’m intrigued! I’ve done it both ways! Turns out great either way! How many carbs would these work out to? For the cheese cups only, mine were about 1 or less but it depends on what cheese you use because they vary by brand. For the salsa, it’s about 4 net carbs for a serving. The salsa is optional if it’s too high for your count, I just personally enjoy it. Can you estimate how many would make one serving? I would guess per package, it says 1 slice is a serving. However, It will depend on what you decide to fill them with and what your macros allow. I usually eat 2 cups filled with taco seasoned beef and my choice of toppings. Mine didn’t turn out crispy….is it because I didn’t let the cheese brown enough? That’s my best guess. These should crisp up pretty nicely. Can you use Silpat mat or is parchment better? 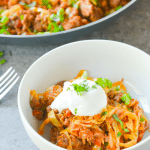 Do you season the meat mixture at all? Looking to use ground beef. 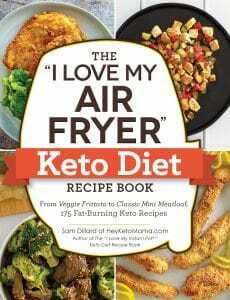 I’m brand new to low carb/Keto. This recipe looks so tasty I can’t wait to try it. I definitely always season the meat. Chili Powder, Cumin, Garlic Powder, Salt and Pepper usually do the trick for me! 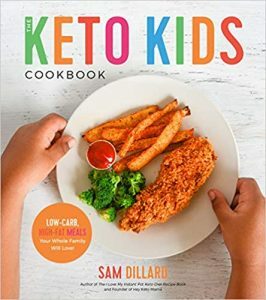 Wishing you all the best on your low carb/Keto journey!! 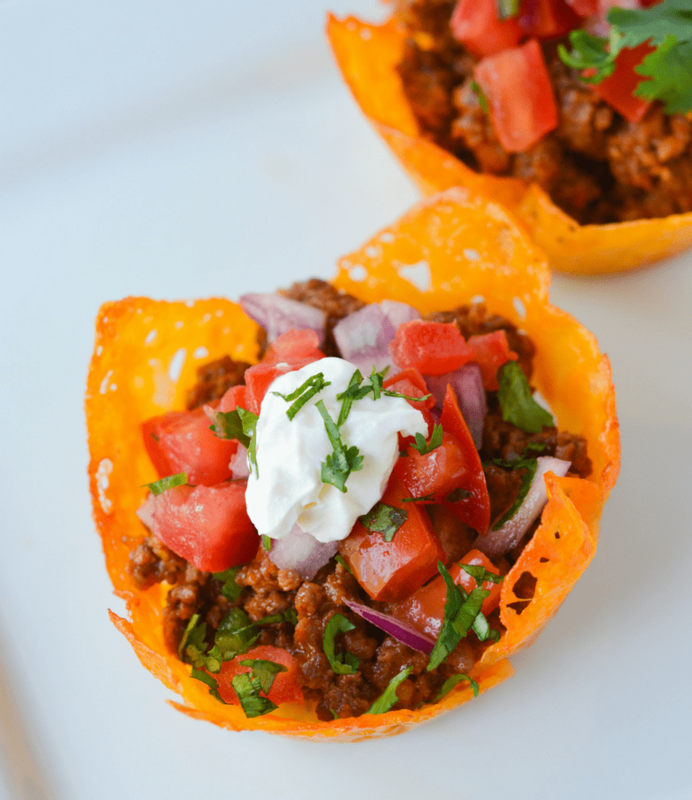 OK, I tried them and have got to say they’re the best low carb recipe I’ve tried so far! I’m new to low carb cooking and most of the stuff I’ve tried is a poor imitation of the “real thing”. I found some no carb fresh salsa in my local store so used that with shredded cheddar and sour cream over seasoned ground beef and they came out so well. They are going on my “keeper” list. Thanks! Genius! This is a game-changer for easy weeknight meals. 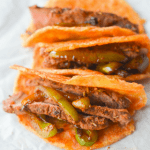 Taco night is back on rotation! You can also flip the muffin pan over and drape them over the cup to a) get a slightly bigger cup, and b) they are easier to remove (less breakage) once cooled. It says 6-8slives of cheese but yields 4. How many slices go in each cup? 1 slice per cup. 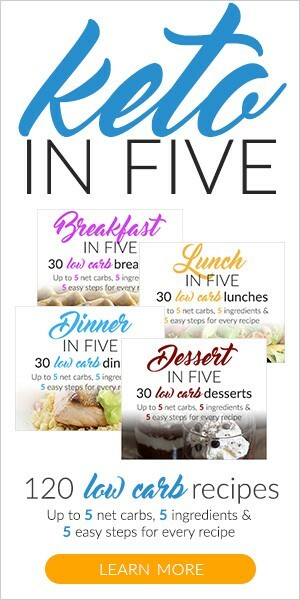 6 slices for bigger cups if you’re extra hungry or 8 slices for 4 servings of 2 cups each. I’m thinking of making these for a small work potluck, can I make the cheese cups the night before? Wondering if they will keep overnight? Does it matter if cheese slice is thick or thin? (Mine was not thin)The cheese melted all over the pan-so I don’t think Iundercooked it.I did cut it into squares-but it’s not crisping up-in the muffin pan! Any ideas? We want this one to work! Thanks???? I think thicker cheese would need extra time but maybe bumping the temperature up a little and keeping a close eye on it would be helpful.